It was supposed to be our big, bonding moment – the veteran White House correspondent and the young, plucky blogger unite on stage, join the mutual admiration club, and reassure the audience that the world is not going to sh*t.
But Helen Thomas didn’t see it that way. The world was going to sh*t and the audience gathered at the Omega Institute’s 2009 Women & Power Conference needed to know that. She wasn’t going to let a little intergenerational performance get in the way of the truth. She talked about the lies that led us into the Iraq War and the pale, puny stuff that was being passed off for journalism nowadays. I tried to balance the dark picture she painted with stories of young women discovering feminism through blogs and getting radicalised online. We were speaking two different languages. Mine was hopeful, perhaps naive; I gave the audience anecdotes that I knew they would be comforted by. Hers was unapologetically blunt; she didn’t appear to care about comforting people. Even staring down her 90s, she was still writing about deeply discomforting things: ineffective national security, botched foreign policy, and White House obfuscation. When I heard that Thomas died, I returned to this moment. At the time, I remember being proud that I had “rescued” the tone of that panel – helped people see that they need not go home utterly depressed about the state of the world. But when I thought back about that panel this week, it was Thomas I was proud of. She didn’t give into the lure of being loved by that audience. She didn’t have much use, it seemed, for short-lived admiration built on the seduction of good sound bites. She wanted something more for us, for herself; she wanted truth. Enlightment was more important than entertainment. Unlike so many women of her generation, Thomas prized the truth above all else, including being liked. I wish that wasn’t so radical a notion, so rare an example, but in fact, Thomas is among a small group of public intellectuals that I can point to that have shown me a way of being in the world that is less about style than it is substance. It’s even more remarkable when you consider the era in which she was shaped. My grandmothers, born in the 1920s, around the same time Helen was, weren’t like this. They were smart, passionate women, but truth was not their friend. It was frightening, unladylike, inconvenient. The personal stuff could get you shamed; the political version was the stuff of men’s lives. Women were socialised very systematically and effectively to avoid, repress, and sidestep the truth during Thomas’ formative years. I was born with that inconvenient instinct for truth-telling, so I became a journalist, but I also came of age at a time when journalism looked less and less like the province of truth-tellers and more and more like the province of spin-doctors. It wasn’t how dogged you could be, how unabashed about distinguishing what was real from what was myth, that predicted your success; it was how fast you could process information and come up with a half-baked opinion, how deftly you could turn a phrase, how much you could make readers love you. 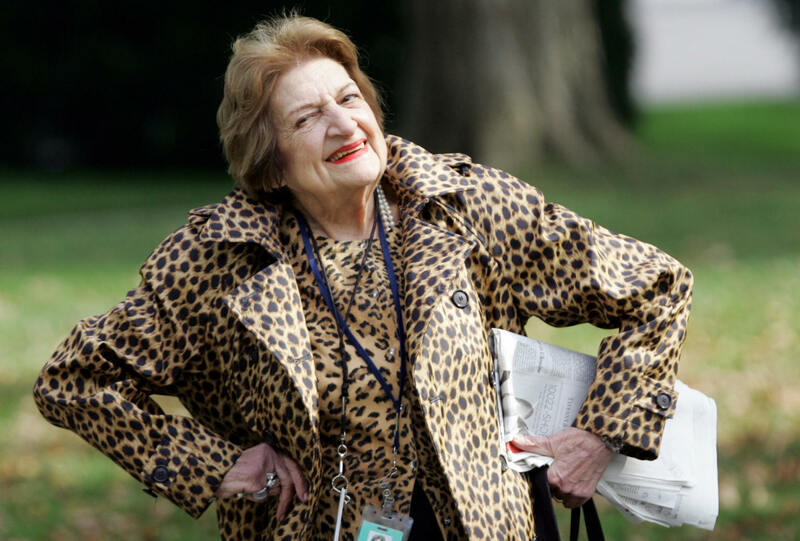 In other words, if Maureen Dowd was demonstrating just how cute and clever I would need to be if I ever hoped to be read, Helen Thomas’ life offered the opposite lesson: seek the truth, kid: the rest is distraction. Being liked is overrated. I’m not in the White House press corp, nor am I an investigative journalist in the tradition of Helen. But her legacy means something dear, something core to me all the same. She provided, and will continue to provide, a set of values that have mostly been drowned out by the blowhard boys of TV and radio and even by the listicle-lovin’, traffic-driven hipsters that seem to dominate online media these days. Her commitment to tough questions and accurate, timely copy in a time of carefully cultivated likability and ever so much focus on style, gives me the courage to be so uncool as to be earnest and so boring as to be less interested in being smart than being right. It’s not that hope isn’t a good thing, but Helen taught me that truth is the best thing.